Ask people who have struggled to lose weight and they will tell you: dieting (ie., calorie restriction) doesn't work. Yes, there may be some decent weight loss in the first few weeks, but, often, this is due to loss of water weight. After that, the rate of weight loss really slows down. One of the key reasons is because reducing your calorie intake puts you in a constant state of hunger. You can't fight that sensation very long. It's too powerful. But, there's another reason: our physiology actually works against us. When the human body senses a substantial decrease in calorie intake, it responds by lowering metabolic rate. This is the body's way of preserving life. In modern society, we can obtain limitless amounts of food at grocery stores and restaurants. But think about how humans lived 20,000 years ago: Food was only available sporadically. At some point, a group might dine on an animal that was killed. For 1-2 days, there are plenty of calories available. Then, they might go another 2-3 weeks before their next kill. Fruits and vegetables were also hard to find. Thus, the body had to have some way to preserve life during these periods of very low calorie intake. Reducing resting metabolic rate is that protection against starvation. Perhaps even more frustrating, our bodies store fat any time we consume excess calories. Here again, the goal is to protect against starvation...in this case, future starvation. It doesn't matter if you are normal weight, 30-lbs overweight, or 300-lbs overweight. If you overeat, you will store calories. It would be great if our bodies didn't store excess calories when we didn't need them, but that's just not how our physiology works. If you consume 500 extra calories that you don't burn, and do that every day for 7 days, after 1-week, you will have gained 1-lb. Now, stop and think how easy it is to consume 500 calories: a couple cookies, a dessert at any restaurant, 43-oz of soda pop. Further, 500 extra calories won't make you feel like you overate. But, do this on a regular basis and it's not surprising why, at the end of the year, you may have gained 20-30-lbs. 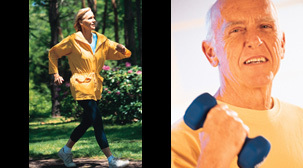 The mission of AthleteInMe.com® is to promote health by encouraging regular exercise. Sadly, as much as I hate to say this, exercising to promote weight loss isn't as effective as you might think. TIME magazine published a lengthy article on this topic in their August 9, 2009 issue. Since then, additional research has validated this disappointing truth. Brisk walking is defined as walking at 3 miles per hour. If you walk at 3 mph for 1 hour, you will burn -- get ready -- about 300 calories. Pretty demoralizing, isn't it? 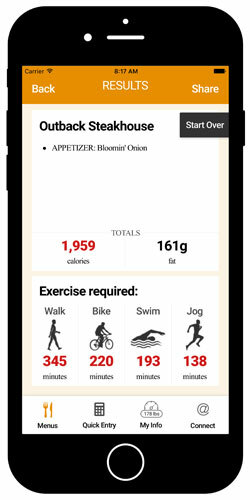 Take a look at the screen shot of our Exercise Calorie Converter to the right: To burn off the calories in Outback Steakhouse's "Bloomin' Onion," a 178-lb person would have to walk for 345 minutes. THAT'S ALMOST 6 HOURS OF WALKING!! Now, of course, no one is going to eat the entire appetizer by themself, but, still, you get the point. It's correct that you burn calories every minute of every day...even when you're sleeping. But a 30-60-minute exercise session accounts for only a small percentage of the total calories you burn in any 24-hr period. Unless you exercise like a Tour de France cyclist or a marathon runner, you burn most of your calories each day by performing your daily tasks: doing the laundry, washing the car, mowing the yard, etc (Hamilton MT, et al. 2007). However, if you have a sedentary job, such as driving a cab or a truck, or a desk job, then the calories you burn each day is greatly diminished. And, at the end of your work shift, you're not going to go out and walk for 3 hours, or, jog for 2 hours. So it's far easier to consume excess calories than it is to burn them off. The fact that (a) weight gain occurs so easily, (b) dieting to lose weight doesn't work, and (c) most people can't perform enough exercise to produce adequate weight loss means that the only reliable strategy for maintaining a desirable weight is to avoid gaining weight in the first place. In May 2016, the FDA announced changes to the design of the Nutrition Facts panel on packaged foods: the "Nutrition Facts and Supplement Facts Label and Serving Size" ruling. The compliance deadline for food manufacturers with $10 million or more in annual sales is January 1, 2020. For manufacturers with less than $10 million in sales, the deadline is January 1, 2021. One new requirement is to display the Total Calories value in larger text. Making the Total Calories value more legible is a good idea, but, I doubt that it will have much of an impact. The Nutrition Facts panel has appeared on packaged foods in the US since 1994. Yet, obesity rates in the US have continued to increase steadily. What about adding calorie values to restaurant menus? Americans obtain one-third of their calories from dining out. So, empirically, it would seem that including calorie values on menus is a good thing. As part of the Patient Protection and Affordable Care Act of 2010, the federal government required chain restaurants with 20 or more locations to include calorie values on their menus. This requirement went into effect on May 7, 2018, however, some restaurants were providing these details even before that. (Panera Bread began displaying calorie values on their menu boards in 2010!) And, some US cities passed similar regulations years ago. For example, New York City began requiring chain restaurants with 15 or more locations to display calorie amounts on their menus in December 2006. Thus, a fair amount of published research has already evaluated the consumer response to displaying calorie values on menus. • A study of adolescents in Hawaii revealed that providing calorie amounts on menus from Denny's, McDonald's, and Panda Express had very little effect on their selections (Yamamoto JA, et al. 2005). • Even when people are prompted to consider calorie values, this information is often ignored: When customers in New York City entered a McDonald's, they were given a slip of paper stating either recommended calorie intake per day, or, recommended calorie intake per meal. Yet, more than half still ordered meals with excessive calories (Downs JS, et al. 2013). • Researchers at the School of Public Health at UNC Chapel Hill reviewed 7 studies that evaluated the impact of including calorie information on fast-food restaurant menus. Only 2 of the 7 studies found that providing calorie amounts had any meaningful impact on menu selections (Swartz JJ, et al. 2011). • In 2017, Sara Bleich, PhD, and colleagues at Harvard reviewed 53 studies of restaurant menu labeling. They found that "there is limited evidence that menu labeling affects calories purchased at fast-food restaurants, though some evidence demonstrates that it lowers calories purchased at other types of restaurants." (Bleich SN, et al. 2017). It makes sense that people don't care about calories when they eat at fast-food restaurants: ie., if you've already decided to grab a couple tacos at Taco Bell, then you're probably not going to change your mind when you get there! • A Canadian study found that one-third of consumers could not properly comprehend basic information on food labels (Sinclair S, et al. 2013). • Perhaps worse, an Australian study revealed that consumers perceived higher-calorie foods as healthier and providing sustained energy (Watson WL, et al. 2013). REPORT CALORIE VALUES IN THE FORM OF "EXERCISE EQUIVALENTS"
Displaying the Calories value in larger text on the Nutrition Facts panel on packaged foods, and, reporting calorie amounts on restaurant menus is just "more of the same." As I mentioned at the beginning of this article, we've been reporting calorie amounts on packaged foods since the mid-1990's and obesity has continued to worsen. Doing the same thing over and over and expecting a different result is the common definition of insanity. "This entree contains 1000 calories." "You will have to walk for 3 hours to burn off the calories in this entree." Which of those 2 statements had a stronger effect on you? I'm pretty certain it was the 2nd one. That's why presenting calorie info in the format of "exercise equivalents" a better strategy. It has more impact on consumers than simply listing calorie amounts. As any clinical psychologist might acknowledge, changing human behavior is difficult. Generating an emotional response is more effective than simply presenting facts. Fear, embarrassment, happiness, pleasure...each of these emotions can motivate people to act. There's a rule in sales that goes like this: "Sell the sizzle, not the steak." So, for example, if you want to sell a car, you impress the customer about its acceleration, its handling, its sexiness, how great they would look driving it. You don't focus as much on the compression ratio of the engine, the power-to-weight ratio, or the size of the gas tank. Those are boring statistics. However, you might explain gas mileage, or, the efficiency of the catalytic converter once you become aware that the customer is really concerned about air pollution or carbon footprints. "Sell the sizzle, not the steak..."
Think about those Pantene shampoo commercials you see on TV. They always show a woman with long, thick, straight, silky hair waving back and forth in slow motion. Those images generate an emotional response: they're hypnotizing, captivating...and effective. Even I want to buy that shampoo when I watch those commercials! For the same reason, expressing calories as exercise equivalents is more effective than simply listing calorie amounts on food labels and restaurant menus...ie., it generates an emotional reaction. That's why I created the Exercise Calorie Converter. Not only does it put the calorie amounts of thousands of restaurant menu items in the palm of your hand, it converts those values into minutes of exercise. This information is presented as minutes of walking, jogging, bicycling, and swimming, specific for the user's body weight. When I show it to people, they react by saying "wow! "...every single time. That's the emotional reaction I was describing earlier. 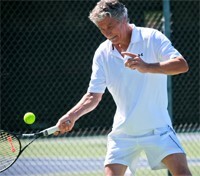 When we launched www.AthleteInMe.com® in January 2005, the Exercise Calorie Converter was included in the web site. Then, we developed a mobile version that ran on PDA's (remember those?!!). This was several years before Apple launched The App Store in 2008. Very quickly, the mobile app marketplace exploded. So, we dropped the PDA version of our Exercise Calorie Converter, and, in December 2010, released a mobile app for both Apple iOS devices and Google Android devices. In the summer of 2013, we released Version 2.0. In February 2017, we released Version 3.0, followed by Version 3.3 in February 2018. Thus, we've been promoting the concept of expressing calories as "exercise equivalents" for over a decade. • Johns Hopkins Study (2012): In this study, signs were placed inside 4 convenience stores in West Baltimore near middle schools and high schools. The signs reported how much exercise (minutes of jogging) would be necessary to burn off the calories in sugar-sweetened beverages. The purchases of Black adolescents were monitored for 6 weeks. Although purchases of soda pop didn't decline, fewer purchases of sports drinks and sugar-sweetened iced tea occurred. Purchases of water increased (Bleich SN, et al. 2012). How can the same type of study produce different results? In the 3 UNC studies, the subjects were adults. However, in the USF study, the subjects were undergraduate college students interested in psychology (they were given credits that could be applied to a future psychology class). Also, more than 80% of the college students in the USF study were regular exercisers. These differences in the subjects may explain why these 2 otherwise similar studies yielded different conclusions. • One study evaluated the reaction by consumers to reporting calories as exercise equivalents in France, Germany, The Netherlands, and the UK (van Kleef E, et al. 2008). • In 2016, Shirley Cramer, CEO of the Royal Society of Public Health in the UK, called for food labels in the UK to display calories in the form of exercise equivalents. This was reported in The Guardian on January 14, 2016 and again in the British Medical Journal on April 6, 2016. Which country will be the first to routinely report calorie values as exercise equivalents? If Michael Bloomberg were President, I would predict that the US would be the first. As Mayor of New York, Bloomberg focused a lot of attention on nutritional issues. (New York City was the first in the US to require that franchise restaurants display calorie values on their menus.) However, considering that it took 8 years for the restaurant menu regulation to go into effect nationwide, my bet is that the UK will be the first. Because it's far easier to consume extra calories than it is to exercise them off, preventing weight gain before it occurs is the key to maintaining a healthy weight. Avoiding calorie bombs when you dine out is critical, but most people gain weight because they overeat modestly on a regular basis. Maintaining an ideal weight requires making smart food choices....every single day. Unfortunately, you can't identify high-calorie items on restaurant menus by simply looking at their names. You need to know the calorie amounts of all items before you make your choices. But, seeing how long you have to exercise to burn-off those calories has the greatest impact. 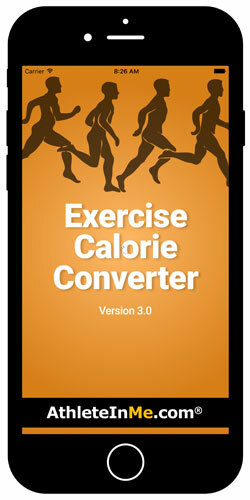 Use our Exercise Calorie Converter mobile app to help you make smarter choices when you dine out!